Here at the My Favorite Things Challenge & Inspiration blog, we're happy to bring you fresh and exciting challenges every week. It's so fun to see how our challenges inspire you, and we're thrilled to have you along for the ride! Maybe you're new to card making or perhaps you're revitalizing your involvement in our creative hobby. Whatever your skill level, there's always something to inspire you when you take part in our sketch, color, and Blueprints challenges. 1. Be Inspired - For every challenge, the MFT Creative Team gets the sketches and color combinations ahead of time giving them the opportunity to share their ideas. It's super fun every week to see what they come up with, don't you agree? 2. Challenge Yourself - Sometimes a color combination might stump you or a sketch looks complicated, but challenges such as these give you the opportunity to stretch your creativity. 3. Create Pretty Things - While all of the projects we share are pinnable eye candy, I particularly love how pretty our color challenges are. The harmonious colors are a visual feast. Don't have the exact colors of the color combination? Just use ones that come close. Use all four colors in your creation and add some neutrals if you like. 4. Participate No Matter What - Don't have a lot of My Favorite Things product? No worries! We love having you as a part of our community, and that leads me to my next point which might help the situation. 5. Win Prizes - For every challenge there is a randomly chosen challenge winner. You can win a gift voucher $50 which could lead to you having more of our stamps and Die-namics. See where I'm going here? All you need to do is participate. 7. 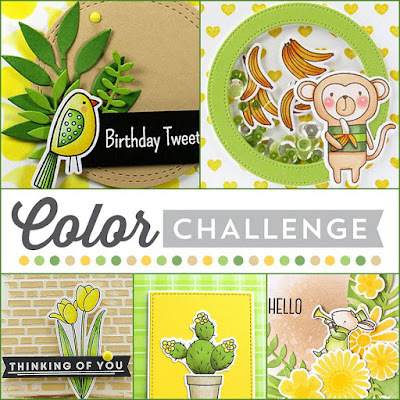 Use Our Resources - We've had 42 Color Challenges thus far (with more to come! ), and you can find all 42 color combinations HERE. This resource is kept up-to-date every time a new challenge goes live. The same is true for our sketch challenges. You can find all 274 of our sketches HERE. 8. Meet Creative People Like You - One of the most wonderful parts of our challenges is the ability to be inspired by people who love to create just like you do. After you post your project, scroll through the InLinkz and leave comments on the other entries. Who knows? You might find a new blog to follow or make a new friend! 9. Make People Happy - Your handmade cards are a source of joy not only for you but for the recipients of your lovingly made masterpieces. It's fun for everyone, so why not invite your friends to join us, too? 10. Follow Our Blogs - Never miss a minute of fun by subscribing to this blog and the My Favorite Things blog either through a blog reading feed or by getting email updates. If you don't know how to do that, let me know in the comments, and I'll walk you through the process. Not only do we host our weekly Wednesday Sketch Challenge (every Wednesday), two MFT Color Challenges a month (2nd and 4th Thursdays), and a monthly Blueprints Challnege (3rd Thursday) we are here to inspire every day of the week! Mondays are for learning. Our Tips, Tutorials, & Techniques series gives you access to videos giving you optimum learning and whole lot of fun and inspiration! Tuesdays are for shout outs. We're always on the lookout for great projects our followers are creating with products from My Favorite Things, and we share them in our weekly You've Been Spotted series. We find so many inspiring things on Instagram via #mftstamps and lots of awesome and creative cards are posted in our two Facebook groups on a daily basis. Join us HERE and HERE. Fridays are all about inspiration. As you swing into your weekend, we leave you with inspiring themes, product, and projects that will make you want to craft the day away with our Inspiration Friday series. Have any questions about the challenges that you'd like us to answer? Leave them in the comments. We're happy to help! You make our job a joy, and we appreciate you so very much! This was fun to read! Thanks for the encouragement. I'm new to MFT but already have a few supplies in my stash and look forward to the opportunity to use them for your challenges (or simply because I want to create with them)! So glad to hear that, Kate! We can't wait to see what you create! Thanks for sharing these information. I was a little shy to participate but I sure will in the future. I love MFT Blueprints. I'm bulding my colection so I would sure use some gift voucher too. Great prizes. Hugs from SLovenia. I'm glad that this post gave you the confidence to give our challenges a try! Don't be shy! Is there a list of rules for the challenges anywhere? I'd looked earlier and didn't see any. How many entries per person, is it required to link to the challenge on your blog/flickr, etc etc (like SSS for example... max 5 entries, must have a link on your blog, no backlinking... so on and so forth). Hi, Danielle! You can enter as many times as you like, as long you follow the sketch or the color challenge. At the end of each challenge post, there is an InLinkz that allows you to link to your blog or Instagram or Flickr — wherever you project for the challenge is. Does that help? Let me know if you have any other questions. Thank you! This post was tremendously helpful...I love that you provided the big picture!